Dear Mona, I Don’t Want Children. Am I Normal? I’m a 37-year-old woman, with a master’s degree, who is single and childless by choice. Am I normal? I could give you a quick answer here: U.S. birth rates have declined, so compared to many women in America, you’re perfectly normal — just one of a growing number of adults who are having it all without having children. But I’m not going to say that. When it comes to testing the normalcy of “childless by choice,” birth data fails to reflect three important scenarios: women who wanted to have children but didn’t, women who didn’t want to have children but did, and women who don’t have children but plan to someday. Looking at the whole picture, more women are childless, and for many of them it’s by choice. In 2006, two researchers published a study in the Journal of Marriage and Family that attempted to identify voluntary, involuntary and temporary childlessness. Using responses from 2,479 women age 35 to 44 reported in the National Survey of Family Growth, the researchers can help answer the “by choice” part of your question. They found that in 2002, 43 percent of childless women 35 to 39 were temporarily childless (i.e. they expected to have children one day), 16 percent were involuntarily childless (i.e. they wanted to have children but couldn’t), and 41 percent were voluntarily childless. That’s a lot of childless women who, like you, have chosen to forgo motherhood. Sounds pretty normal. Even among other age groups, a lot of childless women are voluntarily so. So, you’re in a minority, but not a tiny one. But here’s another thing: The definition of normality can be just as much about why people make the choices they do, as how many people make those choices. Only you know why you don’t want to have children, but the fact that you mentioned your master’s degree is telling. The more educated a woman is, the more common childlessness is. Of all women ages 40 to 44 who had a master’s degree in 2008, 25 percent were childless compared to just 15 percent of women who had not graduated from high school. So, which women are having children? Here, we need to set aside the question of choice and move from survey responses to national data — specifically numbers from the Centers for Disease Control and Prevention (it’s an American source, but America and Canada are basically the same country, right?). The overall birth rate fell to a historic low of 12.6 births per 1,000 women in 2012. But for women your age, the reverse is true. In 1970, there were just 2.1 live births per 1,000 women ages 35 to 39; that number has risen more than fivefold since, to 11 births per 1,000 in 2012. 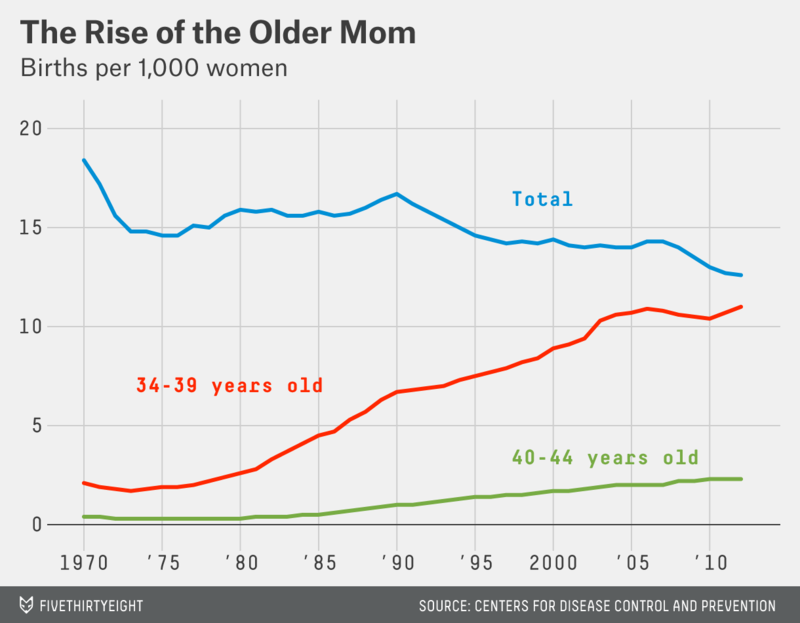 The lines on the graph seem to contradict the notion that a rising percentage of older women are childless, right? Wrong. See, the fact that in 2012, there were 11 babies born to every 1,000 women ages 35 to 39 doesn’t mean that 11 women in your age group became mothers. 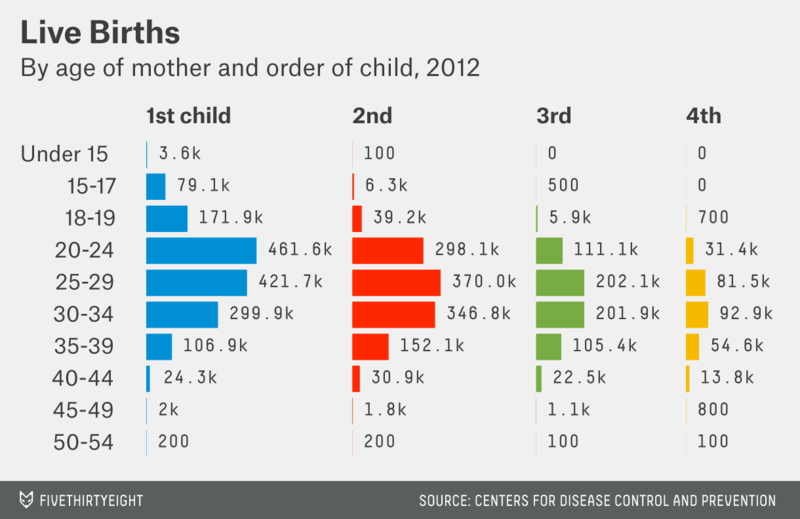 For many of them, that birth was their second, third or fourth child. That means there are a lot of women your age who aren’t just becoming mothers, they’re becoming mothers for the second, third or even fourth time. At the same time, a growing share of older women are childless, and almost half of them are, like you, childless by choice. In earlier centuries, childless rates largely reflected either infertility or lack of access to marriage or both. Today, however, marriage is no longer a requirement for motherhood, infertility is less likely and more easily treated, and women have other means of becoming parents even in the event of biological infertility. Instead, a number of factors have converged to make it easier and more appealing to forgo motherhood — including the rise of opportunities to pursue demanding and fulfilling work careers and the increasing social acceptance of the childless option. On that last bit: As choices about “otherhood” (choosing not to have kids) are changing, so, too, are attitudes toward it. In 1988, only 39 percent of adults disagreed with the claim that people without children “lead empty lives.” In 2002, that had risen to 59 percent.